A twitter user has uploaded a series of photos that seems to reveal a new Olympic edition Samsung Galaxy Note. The images show the handset wearing a Union Jack back cover which looks to be a little thicker than that of the average Note. 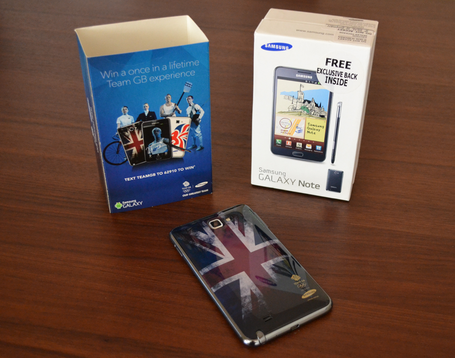 The phone's packaging is also on display, and betrays a second design, this time with the Team GB lion on it. GSMArena reports that the handset will be sold in the UK through O2, and Samsung is also producing a Galaxy Y Olympics variant. Along with a new back cover, the Olympic edition Galaxy Note will include a £1 (around $1.55) contribution to "Team GB athletes of the future," and the chance to win tickets to the Olympics.